The Dragonfly Yoga mat cleanser was designed with super mild and effective soap based formula that works on all water safe surfaces, including all of your balance balls, foam blocks, chairs, cushions, straps and all your other Yoga and Pilates accessories. Designed to keep your accessories clean disinfected and smelling fresh. The accessible 8 oz travel size fits perfectly in your yoga or gym bag, or your purse. Daily Cleaning: Spray 3 times onto a wet cloth or paper towel and lightly scrub. Wipe down mat with clean cloth and air dry. Medium Cleaning: Lightly spray onto mat. Rinse, wipe dry, air dry. Deep Cleaning and Restoration: Spray directly onto mat and soak 3 minutes. Work into a lather with a wet cloth, rinse, wipe dry and air dry. Repeat if needed. Yoga mat should be completely dry before storing or using. Regular cleaning will extend the life of your favorite yoga mats. 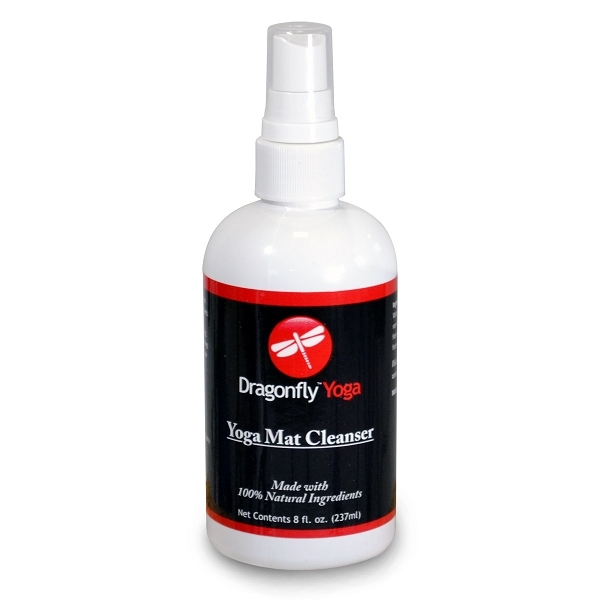 The Dragonfly Yoga Mat Cleaner in the 8 oz size is perfect for sticking in your yoga gym bag or purse. Great for after class and daily cleaning.